Bobby, a young hospice caretaker, and his elderly cancer patient Geraldine have formed a deeply honest and beautiful connection with each other as she lays on her deathbed moments away from the end. But are Bobby and Geraldine simply just friends or is it actually something more? Another Cancer Movie is just another cancer movie, about two independent filmmakers making a movie about cancer, because cancer movies are in right now. 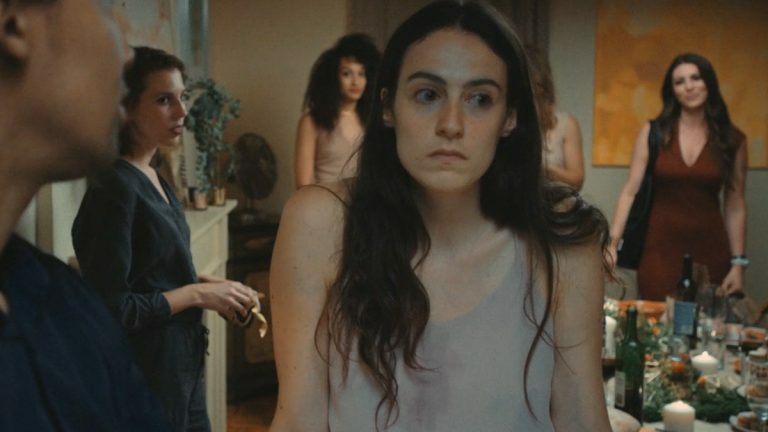 Created by Joe Burke and Oliver Cooper who also star in the film, the story takes an odd bite at filmmakers willing to go through anything to shoot a film that will hopefully make it to the most prestigious festivals. Joe tells us a little more about his process. As a filmmaker, I am always setting out to make work that is personal and inspiring. But this project is definitely the most personal piece we’ve made. Oliver Cooper’s aunt Becca, who stars in the movie along side Oliver and I, was battling breast cancer last year (2017) when we shot this. She was going through chemotherapy and had lost all her hair. We were ultimately inspired by the real life situation. 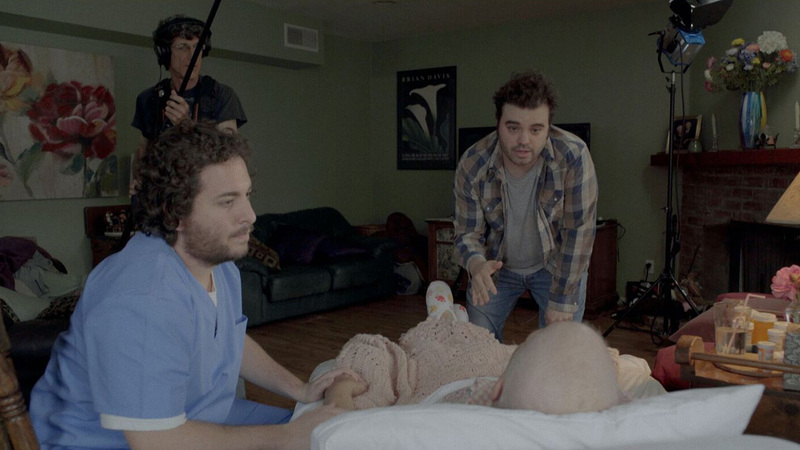 As Oliver and I were brainstorming one night at his apartment about making another project, something that could incorporate our lives and what Becca was going through, we had a big realization that the idea of these two bozos (our characters) making a movie with his aunt going through chemo was the film. It naturally became a film about two guys arguably taking advantage of their aunt with cancer, trying to make a “dramatic” film about cancer. It all become super meta very quickly, which is my favorite thing to do. (SPOILER ALERT) When we approached Becca with our unconventional idea the next day, she really opened herself up to it, and fully embraced the project. We did say, “…and you’re gonna die in the end.” She just looked at us, shook her head, rolled her eyes, and smiled. She was 100% in for the adventure. Becca truly gives such a lovely and vulnerable performance in the film. And even though Becca was really going through it for real, she definitely brought her acting chops to the table. She’s a natural. And then we were lucky to get Burton Berger involved, who had never acted before, but he’s a wonderful musician who Oliver and I knew a little bit, and we just had a sense he would be a perfect fit in the film with us. This project came together very quickly. From the time we initially thought of the idea till we were shooting was only ten days. We locked down an ambulance to rent, which was our biggest expense. I brought my frequent collaborator and cinematographer Daniel Kenji Levin on board, who I love working with. We shot the film in one day. 12 hours. 8am-8pm. It was a tiny crew, as you can see in the cast and crew photo. We shot with two cameras, the Sony A7S. Everyone did an amazing job and worked great together. Leading up to the shoot, Oliver and I spent about a week workshopping the script and rehearsing it. Unlike some of our other projects we’ve done that have a lot of improvising, we really wanted to do a comedy that was tightly scripted on the page, that was our goal for this one. It was very scripted in a good way, and allowed us to really be sharp with the dialogue and beats. We also knew shooting a 16 page script in 12 hours was a lot, and would take some serious preparation. We wanted to be sure the movie totally worked on the page before we shot. It was a really a special experience making this one, from start to finish. For us, this was a very therapeutic project. A way for us to find the humor in what was really a tough time for everyone. But we feel it’s always important to find the humor in life. As difficult as that may be at times. Sometimes laughter is the best medicine. We’re all on this adventure of life together. Becca is now cancer free and living her life to the fullest. We hope everyone enjoys the film as much as we do and shares it with their family and friends.